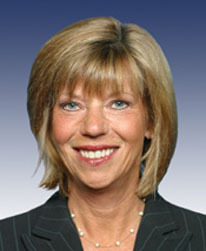 Lobby group executive and widow of US Representative Bill Emerson, appointed to Congress upon his death in 1996 and re-elected every two years thereafter. Conservative Republican: generally anti-abortion rights, anti-gay rights, pro-gun rights. Proposed a constitutional amendment outlawing abortion on her first day in Congress. Supported 1998-99 Clinton impeachment, 2001 USA PATRIOT Act, 2002 Iraq War resolution, 2008 GM/Chrysler bailout, and 2008 Wall Street bailout. Opposed 2009 economic stimulus, 2010 health care reform.